I got myself a 24-inch flat screen for Christmas, so there. Anyways, the map. It looks great, I really don't have any complaints or suggestions. Last edited by cairnswk on Mon Jan 12, 2009 2:14 pm, edited 1 time in total. The only thing I can say is that it looks a bit odd where the mountain texture ends and Gordonvale starts. The change is just very abrupt. Maybe extend the texture over the playable territories, or at least Gordonvale, but much more faint. Oh, and I still think you can do better on the grass in the bottom left. Other than that, this is looking great! ZeakCytho wrote: Other than that, this is looking great! 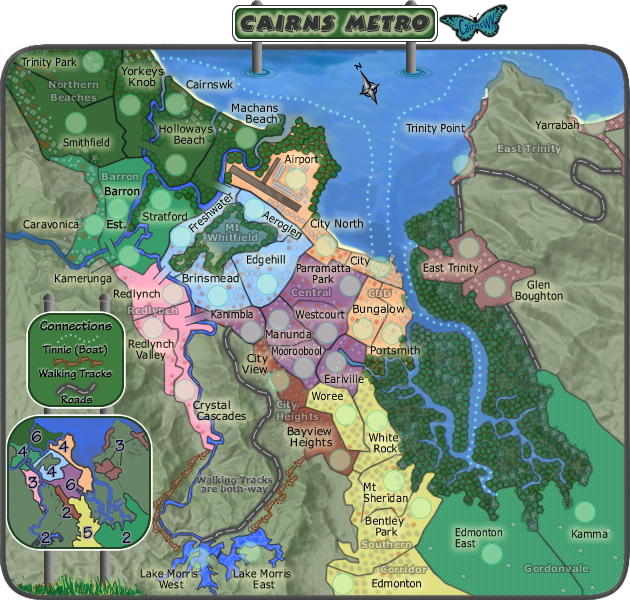 ---The Cairns Metro Map has reached the ‘Final Forge’ Stage. The map has passed rigorous gameplay and graphics examinations, and major concerns have been addressed. If there are any other current concerns, please make your voice heard. If after a reasonable amount of time there has not been any objection or protest, the map will be deemed finished with the 'Foundry Brand' of approval and will be submitted for live play. As long as there is still discussion or posts that have yet to be commented on, the map will remain in Final Forge until said discussion has reached the conclusion that the map has reached its final and polished version. ZeakCytho wrote: The only thing I can say is that it looks a bit odd where the mountain texture ends and Gordonvale starts. The change is just very abrupt. Maybe extend the texture over the playable territories, or at least Gordonvale, but much more faint. Zeak...i have investigated the edges near Kamma re the mountains etc, and i am reluctant to change anything there, yes i agree it looks odd, but watercolouring/painting over it is going to make it look even worse, smudgy and all that. And it is not a case of extending that texture over the playable areas. This is a underlying bitmap that has been cut right close to the edge there. To fix it i would have to redo the whole lot again on both maps. As for the grass.....i'm happy with it. Thanks for the Forge, oaktown. XML has been checked and the coordinates look good, but I have one little request to make... in staring at the coordinates and doing the connection checks, I was confused at first as to why Caravonica doesn't border Kamerunga, because it looked as if the bridge from Barron actually comes out of Caravonica. I figured it out, but my initial confusion was a result of the fact that most of the Caravonia/barron border is rubbed out by the glow around Caravonica's name and army circle. Could both the circle and the title be moved to the left a few pixels to restore that border? The problem only occurs on the small map - the large map is fine. After this, I'd say it's about done. oaktown wrote: XML has been checked and the coordinates look good, but I have one little request to make... in staring at the coordinates and doing the connection checks, I was confused at first as to why Caravonica doesn't border Kamerunga, because it looked as if the bridge from Barron actually comes out of Caravonica. I figured it out, but my initial confusion was a result of the fact that most of the Caravonia/barron border is rubbed out by the glow around Caravonica's name and army circle. Could both the circle and the title be moved to the left a few pixels to restore that border? i've moved the Carvaonica text behind the circle and made the bridge smaller on both version. you made fast work of that suggestion! oaktown wrote: you made fast work of that suggestion! ---The Final Forge period has concluded for the Cairns Metro Map. All objections have had their time. 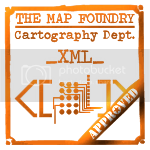 The Foundry and I hereby brand this map with the Foundry Brand. Let it be known that this map is now ready for live play (barring any Lack vetoes). 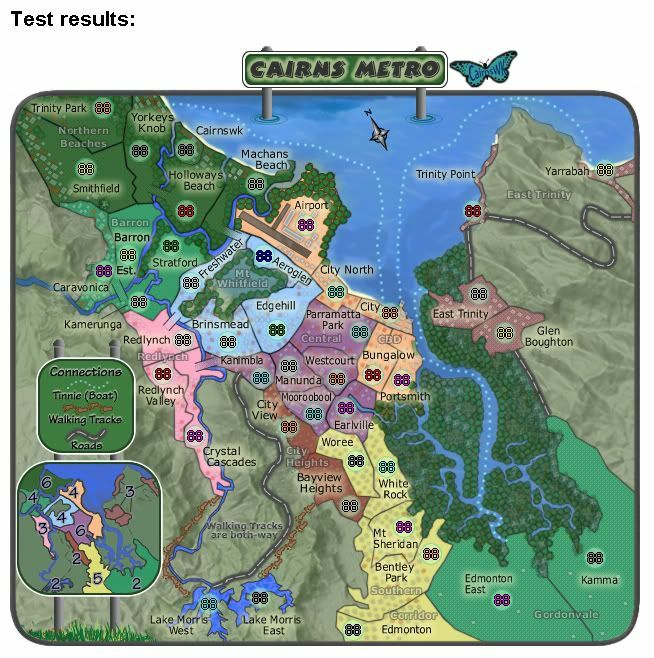 Quick geographical question... How can Parramatta be in both Cairns and Sydney? 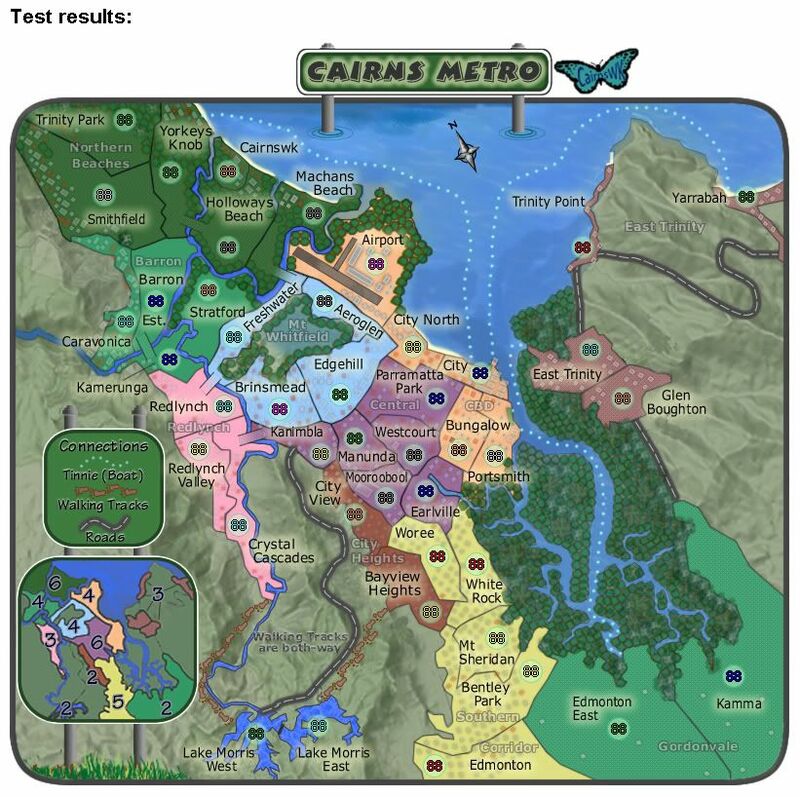 Gilligan wrote: Quick geographical question... How can Parramatta be in both Cairns and Sydney? They're only suburb names Gilligan...lack of creativity on the "founding fathers" part??? Who knows?! EDIT: You had me worried there for a mo. Parramatta Park is in Cairns. I didn't read the entire discussion on the map, but aren't there supposed to be 5 neutral start countries? I'm in a doubles on the map, and someone started with a bonus! It was game over from Round 1. Your opponent must have got very lucky. There was only ever three terts targeted for neutral start and those were one each of the two tert regions. Last edited by cairnswk on Mon Feb 16, 2009 1:11 pm, edited 1 time in total. lackattack, hatchman has picked up that one of the neutral starts in this map is misplaced. I have corrected the error...and below is the adjusted xml for upload please. Does anyone else feel that the Lake morris bonus of +2 is a little overpowered? EagleofGreenErth wrote: Does anyone else feel that the Lake morris bonus of +2 is a little overpowered? On most CC maps, +2 is high for a two territory region. However, it seems to be in line with the other bonuses on this particular map - there are two other regions of similar size/bonus. As there have been no other concerns for over three weeks, are we feeling a listing of the BETA tag here? I think he's referring to the fact that this map is out of Beta, and properly into Live Play!